Our heroine is Kasumi Toyama, who's a loopy happiness machine. She never slows down or makes much contact with reality. She's great. She might go out of her tiny mind and go on stage to perform the world's worst-chosen song. She gets a guitar and starts a band even though she can't play it. She doesn't seem to think that's a prerequisite. During class discussions of the school culture festival in ep.6, Kasumi gets so excited that she needs a translator. She drives the show and I loved her. In fact she's capable of getting hurt as much as anyone else, but you've got to whack her hard to do that and she tends to hide it under general bubbliness anyway. The title sequence is a massive spoiler, telling us from the start that Kasumi will assemble a five-girl band and who'll be in it. The narrative, though, doesn't take recruitment for granted. On the contrary, Kasumi has to work hard for that and in some cases her target's decision is a major story arc. It'll take eight episodes to assemble everyone. Arisa (keyboards) is endearingly grumpy and hostile, never admitting that she's lonely and wants friends. She made me laugh. Rimi (bass) is gentle and meek. Tae (guitar) gets unfairly called the Second Kasumi, while Saaya has personal stuff going on. She's still friendly with the last girl band she walked out on. Is there anything here I dislike? Well, the CGI animation is regrettable in the stage performances. Those should have been the show's dramatic highlights, but unfortunately you're being distracted by doll-like movement and budget-saving frame pans. There are some amusing names. Our heroines call their band Poppin' Party and never wonder if this might suggest drug references. 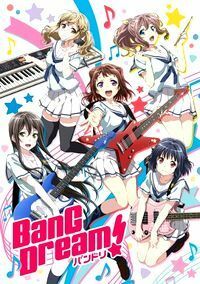 As for the show's title... well, many teenagers have Bang Dreams, but I don't think that was intended. The game it's based on also has a band called Afterglow. It's a fun, happy show. You could call it another dispensable anime about cute girls doing cute things, which it is... but it's doing it well and it has a storyline. It's not just slice-of-life. People are capable of being insensitive and hurting each other, although it's never malicious. It's merely good rather than awesome (i.e. it's not Show by Rock!! ), but I think it does what it does well and I've got a lot of time for it.